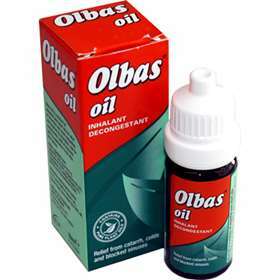 Olbas Oil 10ml is an inhalant decongestant made from natural plant essential oils to offer relief from nasal congestion and cold symptoms including muscular pain. Active ingredients cajuput, clove, eucalyptus, juniper berry, wintergreen and mint. Suitable for use by children aged 3 months and older. Olbas Oil offers relief from congestion complaints including catarrh, blocked sinuses and hay fever. Olbas Bath Oil , Olbas Inhaler two of the many products available in Our Olbas Congestion relief product range. children aged 3 months to 2 years: As an inhalant for add 1 drop of Olbas Oil to a tissue and hold close to nose allowing child to breathe in vapours. Adults and children aged 2 years and over: As an inhalant for, add 2 to 3 drops to a tissue. As a rub, adults and children aged 12 and over to massage Olbas Oil neat into the painful area 3 times daily. Cajuput Oil (18.5%), Clove Oil (0.1%), Eucalyptus Oil (35.45%), Juniperberry Oil (2.7%), Levomenthol (4.1%), Methyl Salicylate (3.7%), Partly Dementholised Mint Oil (35.45%).